Each day with Cadence offers exciting opportunities to create a better, more connected world. We are leading the charge to solve technology’s toughest challenges. Working at Cadence means working alongside the industry’s brightest people and innovating for the biggest, most innovative companies around the globe. Our culture sets us apart as a community of passionate, bold, and creative people. Collaboration is deeply engrained in how we work with each other and our customers. To join Cadence is to join a collaborative, global team united by a shared enthusiasm to explore new challenges. People come to Cadence to do meaningful work with a global impact. Headquartered in San Jose, California, we operate in 21 countries and boast 26 global R&D centers. The Noida, India site is the largest Cadence® R&D site outside of North America. Our EMEA headquarters is located in Bracknell, UK and our APAC headquarters is in Shanghai, China. We never stop learning, never stop exploring, and never stop pushing the limits of what’s possible. At Cadence, we’re changing the future of technology. The Cadence® Academic Network brings together students, educators, and universities with Cadence employees to facilitate learning and thought leadership in our field. Cadence is committed to empowering future innovators with the tools and training they need to thrive in the electronics industry. DISCLAIMER: FORTUNE and FORTUNE 100 Best Companies to Work For are registered trademarks of Time Inc. and are used under license. FORTUNE and Time Inc. are not affiliated with, and do not endorse products or services of, Cadence. 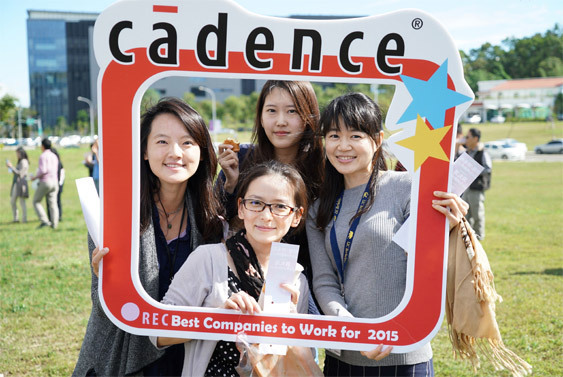 Cadence is honored to be recognized as a Great Place to Work around the world, including on FORTUNE Magazine’s list of the 100 Best Companies to Work For. Our diverse team of passionate, dedicated, and talented individuals go above and beyond for our customers, our communities, and each other—every day. We welcome your interest in the company and want to make sure our job site is accessible to all. If you experience difficulty using this site, please contact staffing@cadence.com. It is the drive, passion, intelligence, and integrity of our dedicated employees that make Cadence a great place to do great work. Here at Cadence I’ve worked with the very best teams that I’ve ever been a part of. The teamwork is so awesome here. That’s what keeps me at Cadence—it’s the team work. We pull together somehow to make the impossible happen. Cadence has a ‘can do’ culture; I feel encouraged to take on very challenging problems and exceed what others have done. Cadence promotes a high-performance culture where employees are able to work on cutting-edge technology in an environment that encourages them to be creative, to innovate, and to make an impact. We differentiate ourselves from the competition with our people and their One Team approach that maximizes customer success. At Cadence, you’ll be part of a team that’s passionate about innovation and excited to work together to make a difference.